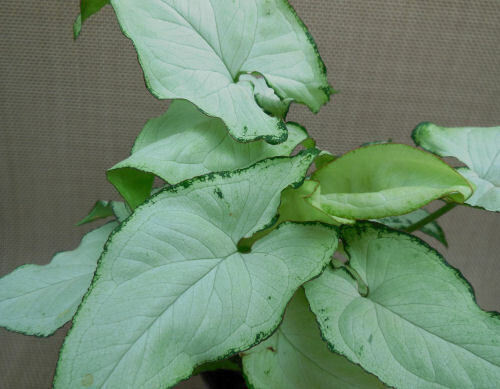 Syngonium plants have been popular indoor plants in many areas of the world for years. The plant originated in South America. It is a fast growing plant for a beginner and is often used as a table top plant. This plant is commonly known as the Arrowhead Vine. One an easily see why when looking at the leaves. Light. 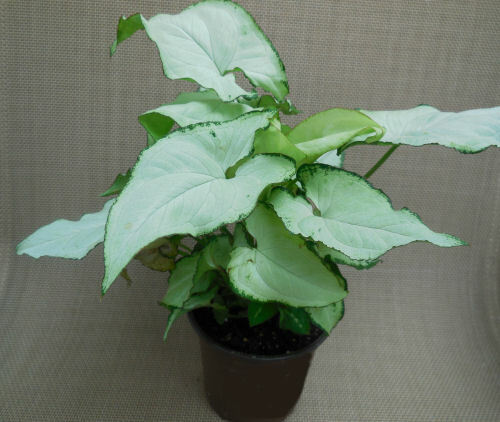 The plant only needs low light, so it can be used in parts of the home where sunlight is not abundant. The Variegated varieties can take a bit more sun, while the solid green types like shade. Watering. Water every 2-5 days during the summer to keep the soil evenly moist but reduce watering in the winter months. They will benefit from misting to keep the humidity high. Do not let the soil dry out. Temperature. Keep the plant above 60 degrees F if possible. Soil. Use a potting soil that drains well. Fertilizer. Feed this plant regularly with a liquid fertilizer during the spring and summer months. No feeding is necessary in the winter. Propagation. Syngonium stems root easily. If your stem has some aerial roots along it, cut this section and root them in water for greater success. Repotting. The plant grows fairly quickly. If you pot on to larger pots, your plant will increase in size. For a large plant, repot yearly. Growing Tips. Us as trailing plants in the home, or train them to climb up poles or moss sticks. They are a wonderful choice for a sun room, where the heat, light and humidity fit their needs perfectly.